Amir Nayyeri, a theoretical computer scientist, is passionate about two things — geometry and soccer — both of which were fostered growing up in Tehran, Iran. During breaks at school, he and his friends would challenge each other with hard math problems, and after school they headed to the soccer fields. 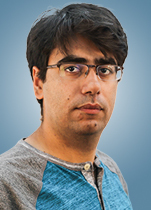 In college he studied computer engineering, receiving his bachelor’s and master’s from University of Tehran, where he focused on networks and systems, but he never lost his love for theoretical math that was sparked in his youth. That’s one of the reasons he switched to computational geometry and topology during his graduate study at University of Illinois at Urbana-Champaign. Morphing two pictures or representing water flow down a mountain are examples of how his work can be applied, but he prefers to work at the theory level. “If you understand a concept very deeply, then applications will show up at some point,” he said. Nayyeri moved to the U.S. primarily for the better schools, but he also was excited to experience a culture that was very different from his own. One of the things he likes about U.S. is that you can get to know people from all over the world. While in Urbana-Champaign he also discovered he liked living in a smaller town where it was easier to get around. In Tehran the typical mode of transportation was by cab, the roads were very crowded, and he would often end up walking most of his way to school when the cab got stuck in traffic. Now that he is in Corvallis he commutes by bike. “I am very happy about that because my life is so much easier now. I can bike everywhere and the weather is very nice even in the winter. Biking in Illinois in the winter was not an option — it’s freezing!” he said. Nayyeri also enjoys hiking. Just north of Tehran are mountains he would hike on the weekends and he is excited about exploring the hiking around Corvallis which has so far included Marys Peak. And although he doesn’t play soccer as often as he did when he was a kid, he still enjoys an occasional pick-up game.